As I sit on a speedboat hurtling towards North Ari Atoll, I hand over an empty plastic water bottle to a crewmember and observe him intently. He stores the bottle neatly in a cardboard box and stows it next to the captain. Several inter-atoll journeys have taught me not to be surprised if these complimentary beverages end up overboard, abandoned to the whim of the currents. Today, I’m keen to see how the captain treats his garbage. A little while later, we enter a neat island harbour and as the vessel berths along its dock, the box is handed over. No watery end for these bottles. It would seem this island is unlike many others. And so I had been informed. Its name? Ukulhas. 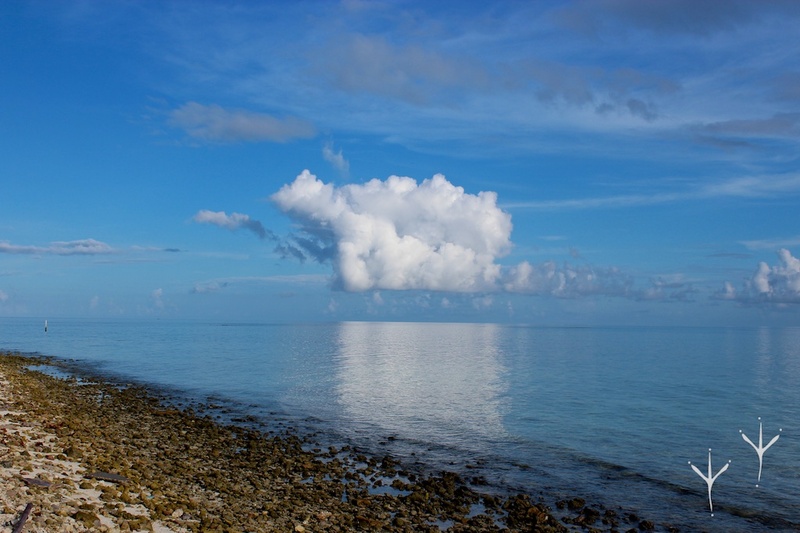 Ukulhas is located in North Ari Atoll, just a short speedboat ride away from the capital. Ukulhas Council Office is beautifully decorated with shrubs and plants growing in up-cycled plastic bottles and island-made compost. 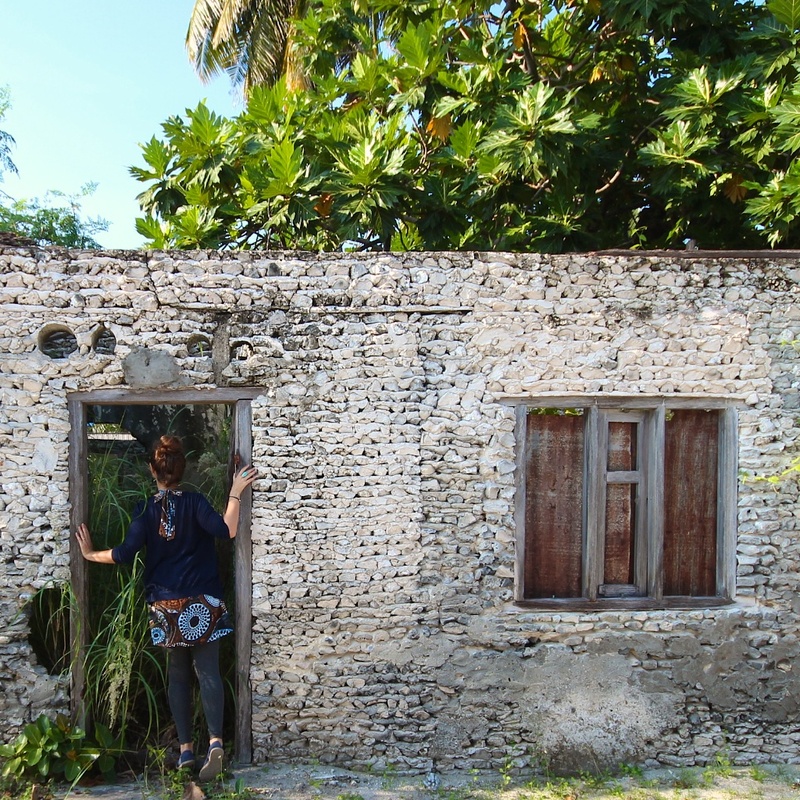 When the opportunity to visit Ukulhas arose, an island growing in fame amongst environmentalists for its successful waste management system, I jumped at the chance. Murmurs of an island where household waste was being recycled had been reaching my ears for a while. In the Maldives such a place sounds almost mythical. 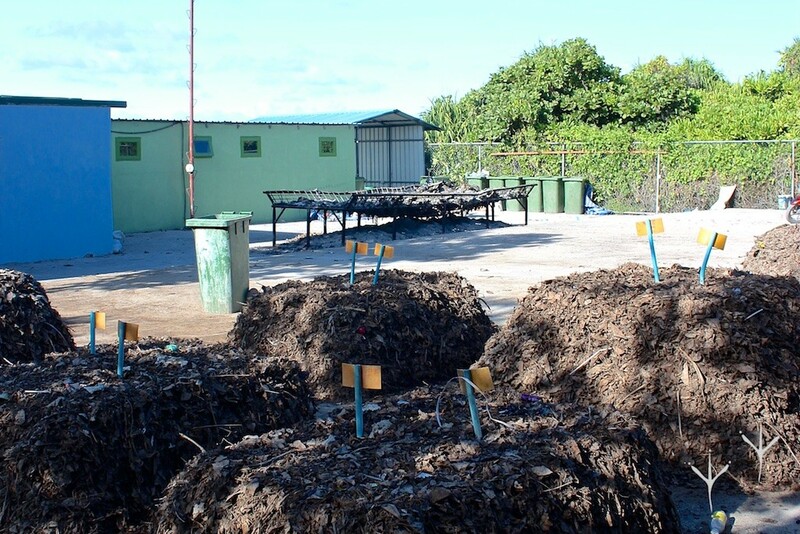 Waste management is nowhere near being under control in the majority of these small island communities. The use of plastic bags and bottles is extensive and much ends up in the ocean. Despite grassroots organisations beginning to sprout throughout the country, such as the Save the Beach NGO, the extent of the problem on a national scale is beyond the reach of such charities. For national success, the solution must be local. If a solution is to be found, each island must adapt. Ukulhas is one island that has done just that, and is showing the whole country how it’s done. The island has an abdundance of dense vegetation. 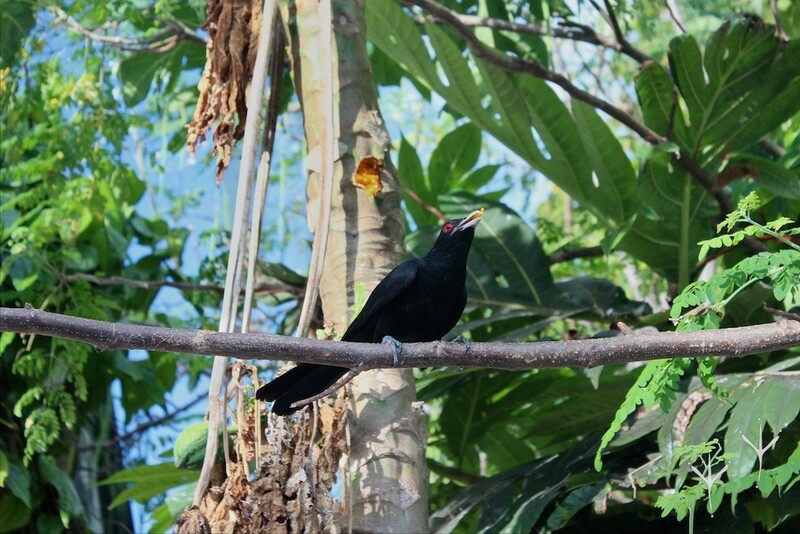 Here, a koel bird eats from a papaya tree. 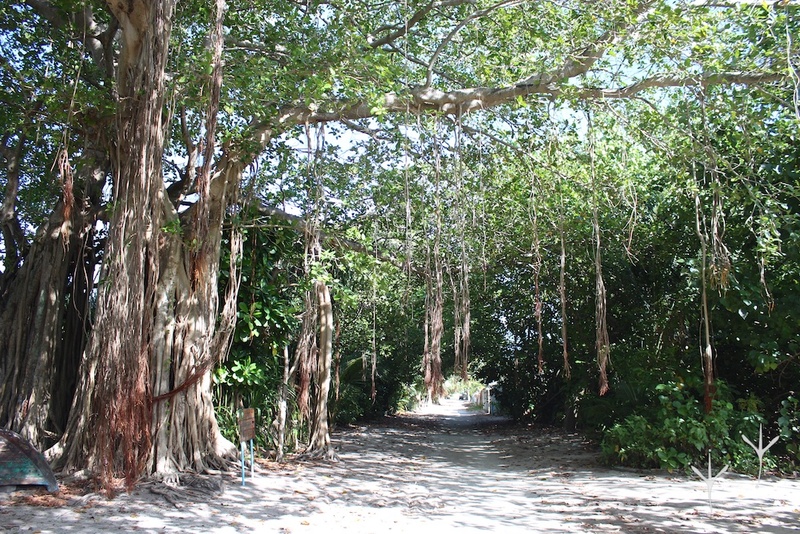 The island has many protected banyan trees. 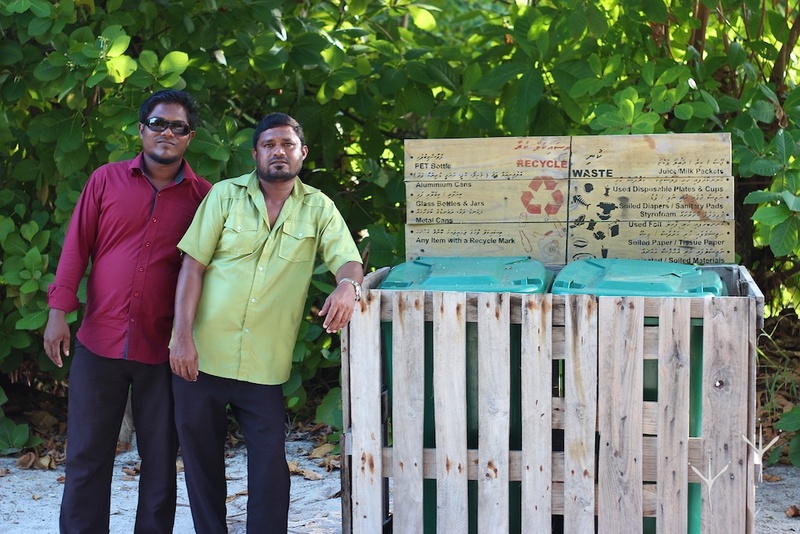 As with all good stories, the tale of Ukulhas’ recycling revival begins with a journey. 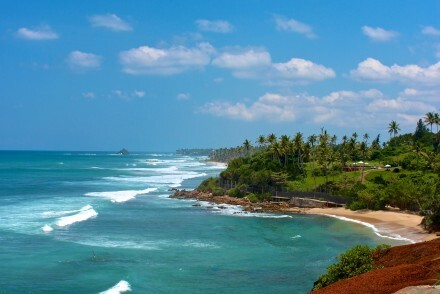 In 2011, the island’s Council President, Mr. Manik was selected by the Environment Ministry to join an envoy visiting Weligama, a coastal town in southern Sri Lanka where an innovative recycling and solid waste management system was gaining fame in the region. The brainchild of Dr. Sumith Pilapitiya, lead environmental specialist for the South Asia Region of the World Bank, the programme was garnering praise for its ability to make money from recycling. For Ukulhas Council President Mr. Manik, the trip would change not only his life, but also the life of all of his constituents. Seeing Weligama’s success, Manik began to see the waste management problem of the Maldives as surmountable. 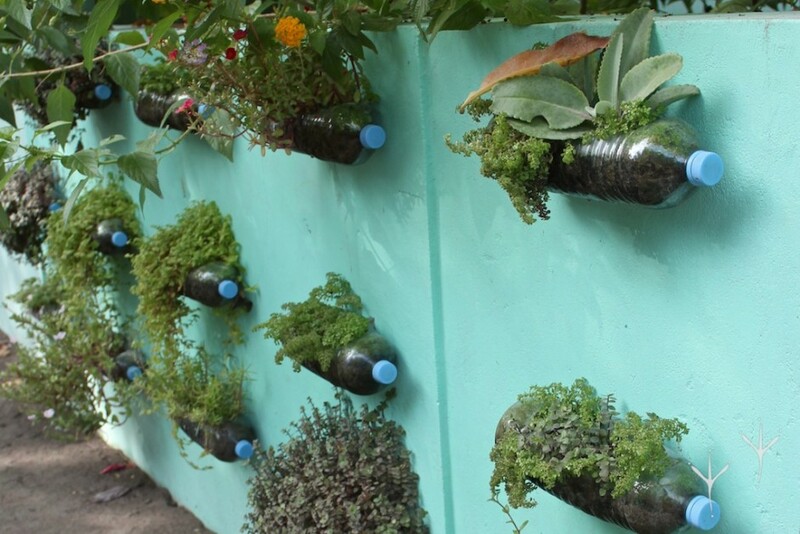 Upon his return, when more than 90% of the islanders responded positively to the idea, the council knew that they had to make their recycling dreams a reality. 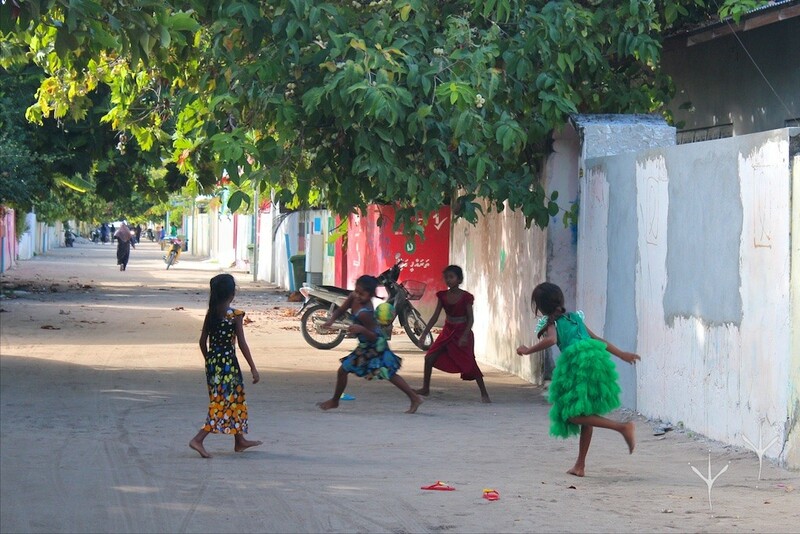 Girls play football under a rose apple tree. Children play in the streets and love to chat to visitors. “The whole island soon looked so much better,” remembers Ali. “We saw the results of our hard work very quickly.” However, there was one effect of the disposal scheme that no one had predicted. Three months after the scheme had been instigated, the health centre approached the councillors with astounding data. “We couldn’t believe it,” exclaims Husnee. “The number of cases of viral fever and stomach complaints had plummeted.” The news of these findings spread quickly on the island and further motivated the community to continue what it had begun. Islanders pride themselves on the cleanliness of their streets. 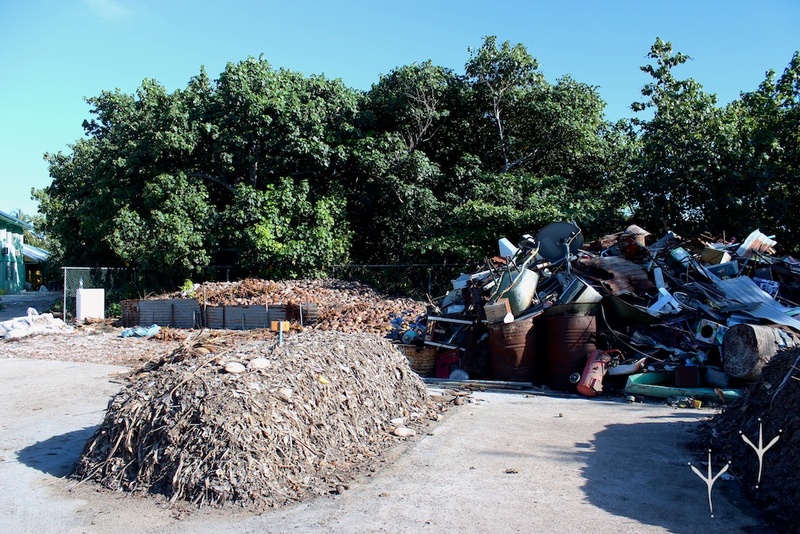 Having by then also visited the Weligama site and worked as refuse collectors to learn the techniques, all the members of the Ukulhas council worked to sift through the rubbish to ensure its proper segregation. By this point, the World Bank had caught wind of these developments and helped the council buy their own pick-up truck. 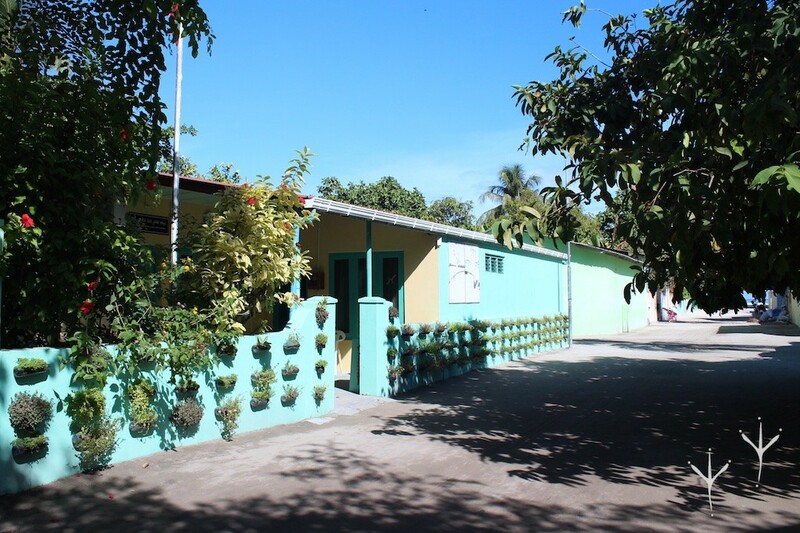 More recently, the World Bank provided the funds to build them an outbuilding and donated machinery, such as wood chippers and plastic shredders, to house in it. Nowadays, the project employs three labourers who separate all metal, plastic, wet waste, leaves and glass. Metal is now sold to a buyer that passes by the island every few months and then sells the supply on in India. Until recently, plastic was still being burnt but after the delivery of the plastic shredder, they’ve finally found a buyer for that, too. The only thing they now burn is paper and cardboard. Councillors Husnee (L) and Ali (R) showed me around the waste management centre. This machine shreds plastic. The centre’s compost is so popular, they can barely keep up with demand. Compost drying in the sun, with metal piled high, ready to selling to buyers from India. In the background, coconut husks wait to be shredded. Of course, there are still hurdles to overcome. Glass remains an issue. As of yet, they’ve found no buyer. They break it up and store it in their unit, in the hope of finding a solution. The beaches are also still a problem. “So much plastic washes up from the passing boats,” Ali admits. “With the increase in local tourism, it’s become essential to keep the island looking beautiful.” With this in mind, they are awaiting the arrival of two additional labourers next month, whose sole responsibility will be to maintain the beaches. 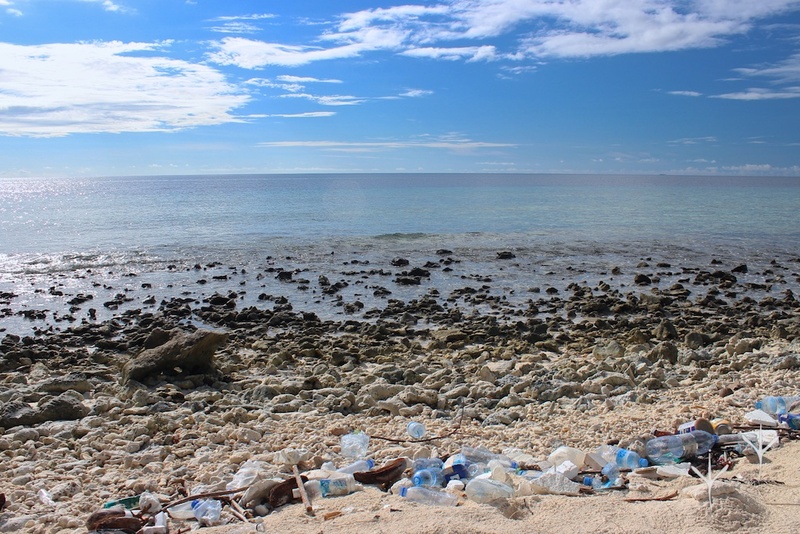 Plastic bottles that wash ashore from passing boats still pose a major problem. Ukulhas has now hired two beach cleaners. 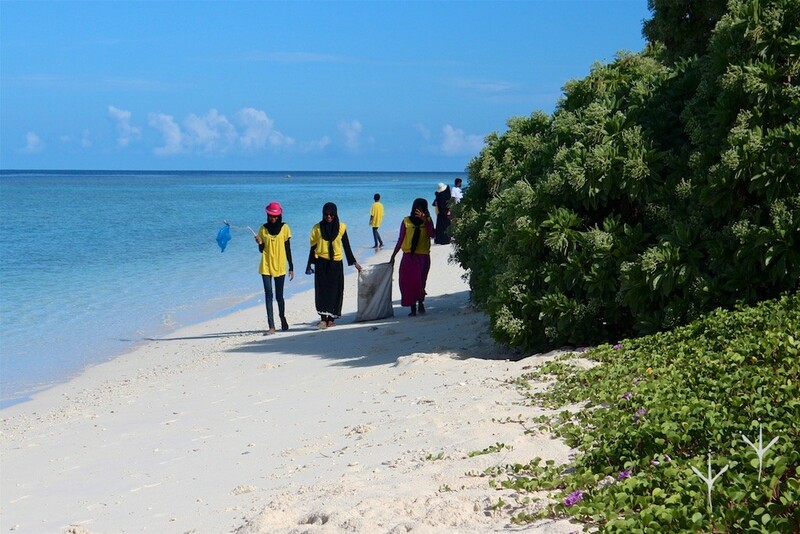 Teenagers take part in a beach clean-up. 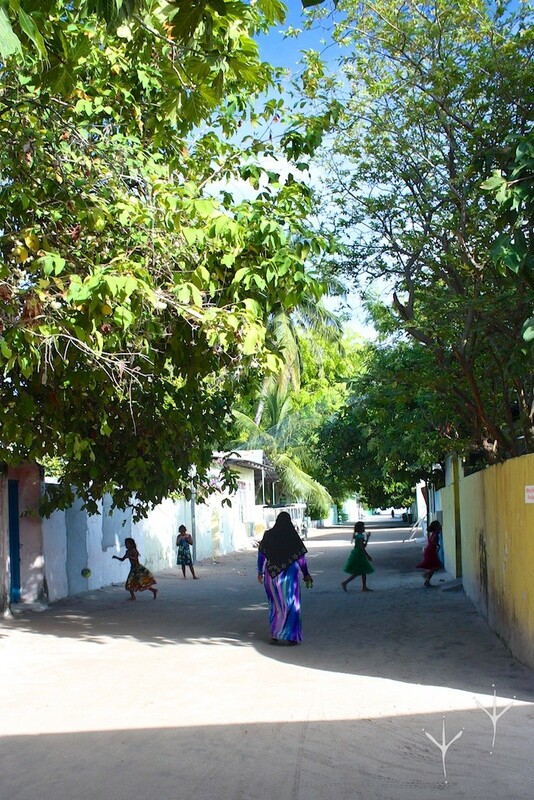 The Ukulhas residents work hard to make sure the island is beautiful for the increasing number of tourists. 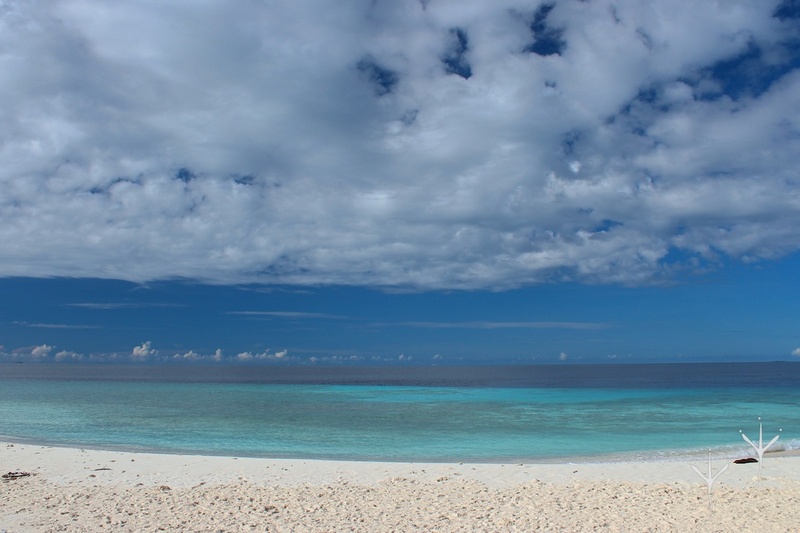 As I stroll along the beach later that afternoon, I see adolescents clutching large sacks scour the water’s edge for any scrap of rubbish as part of an Eco Camp, organised by the island school. Similarly, on January 1st, it has become a tradition for the residents of Ukulhas to hold an annual clean-up event where they blitz the island thoroughly. Everyone from the island gets involves and of course, they celebrate with a barbecue. Ali is keen to see their methods spread throughout the country. Already, several councillors from other islands have visited and are attempting to replicate their methods. Whilst at first doubtful that such schemes could ever be implemented in their islands, with the guidance and training from Ali and his team, the councillors are slowly beginning to have faith. 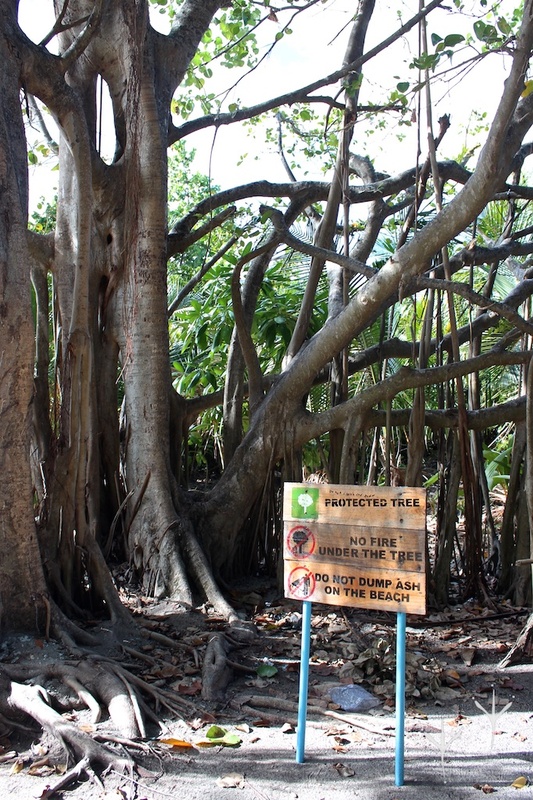 Signs donated by Maldivian NGO Save the Beach. What advice does he have for those contemplating recycling? Well, people shouldn’t just do it out of the goodness of their hearts. “People should simply view this as a business,” Ali says matter-of-factly. “We make money doing this. That’s the bottom line.” He informs me that they currently make about 10,000 to 12,000 profit a month (about 650 to 775 USD), which gets reinvested into billboards, awareness courses and more bins. 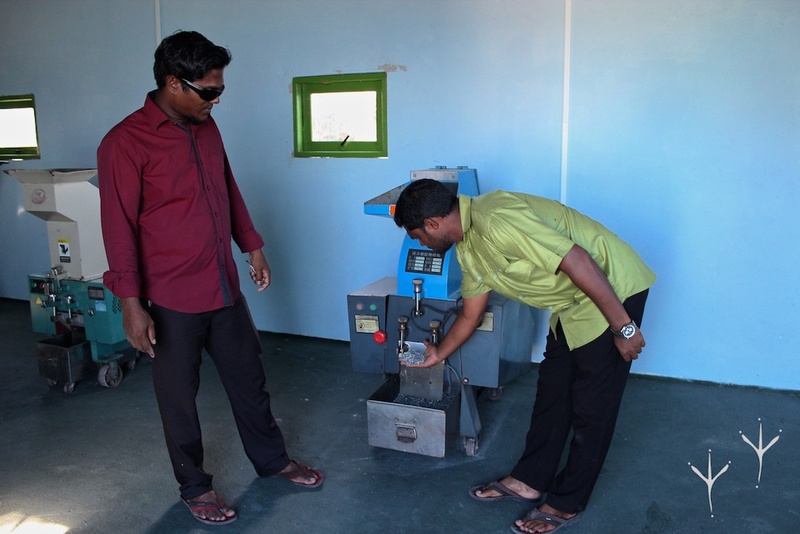 Councillors Mohamed Husnee and Ali Waheed are actively involved in the overseeing of the waste management project. 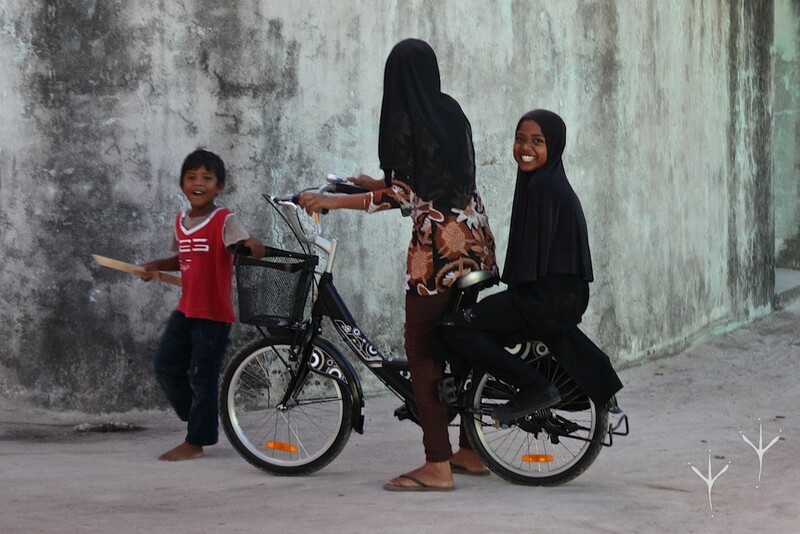 If Ukulhas’ example is anything to go by, the future of waste management in the Maldives looks brighter than some might think. Ali and his fellow councillors have shown that to start a recycling revolution, all it takes is a little team spirit and a can-do attitude. Luckily, the Maldives has both of those in surplus. Wow. I wish we started this earlier in the Maldives. Very interesting article. Hopefully I’ll be able to visit ukulhas one day and see how they have developed it further. Dear Adele , we would like to reproduce these posts in out magazines Quillads.com and Maldives Tourism Archives. How do we reach you? Thank you for your interest. However, i do not wish to have these articles reproduced elsewhere and i do not give my permission to do so. This website is my personal portfolio only. Thanks for stopping by.